Example, videos, worksheets, solutions, and activities to help Algebra II students learn about factorials. The following diagram gives some examples of simplifying factorial expressions. Scroll down the page for more examples and solutions for simplifying factorials. 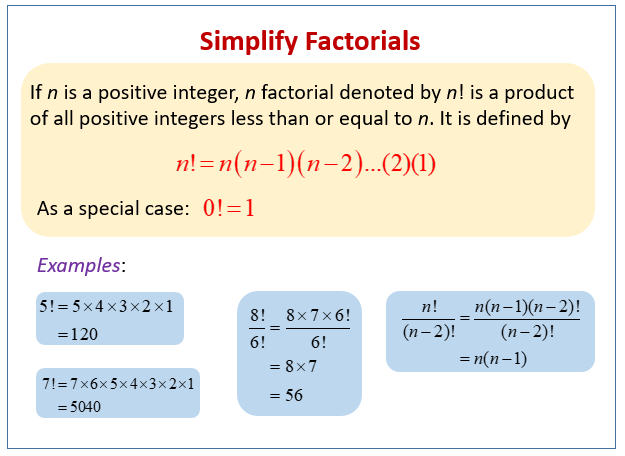 Basic Info on Factorials and some numerical examples are provided. How to calculate the value of expressions with factorials? How to simplify factorial expressions with variables? Why zero factorial equals one? Why does 0! equal one? This is weird! Multiply together all the digits from one up to zero and get one? This video explains simply why mathematicians choose (and it is a choice!) to set this illogical quantity as equal to one.